Call me a geek, but nothing warms the heart more than seeing a project or a product so well planned and executed, you will stop at nothing to buy. If you’ve never been out to the Washington Coast, it’s gorgeous: Rustic and stunning. But there isn’t much in terms of towns, retail, dining, and homes. 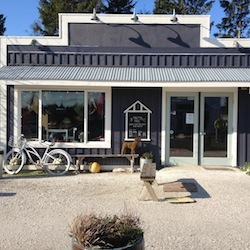 Seabrook, Washington is a “new town.” It suddenly appears around the bend in the highway after you’ve been driving for hours. Through nothing. And it is a case study in utopic urban planning. Casey and Laura Roloff bought 150 acres of land for $3 million using money they set aside from their house painting business. And they are well on their way to building a new urban, walkable city. 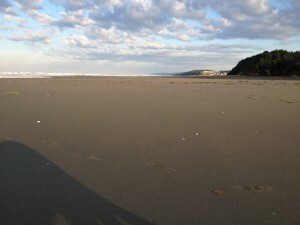 Eventually, Seabrook will be self-sufficient – it has common gathering areas, shops and retail, mixed use, and walking paths to the Pacific Ocean across the street. Soon, they will have community gardens, a farm and a Main Street. Keep debt below 20 percent. Only build when the lots are purchased. Build one block at a time so they can communicate the vision. 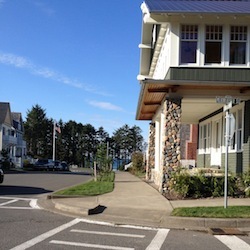 During the recession, Seabrook experienced 34 percent growth each year while other real estate developments have plummeted, or simply plyboarded up. 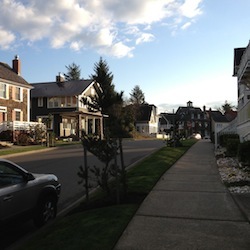 Home values here dropped less than 10 percent vs. 40 percent for the rest of the country. It’s one of the principles in What Would Google Do. Build something so incredible, you just need to get out of the way, and watch it take on a life of it’s own. Because I wish more developers and city planners thought like this, I’m going to describe some of the planning in action at Seabrook before we get to the ramifications on marketing. Also, notice the telescopic view out to the sea. Preserving prime real estate for the public to enjoy – that’s an amphitheater and a great place to sit and watch the sunset. 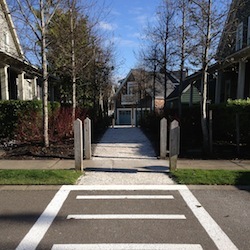 As you move out, as pictured on the right, sidewalks turn to paths. 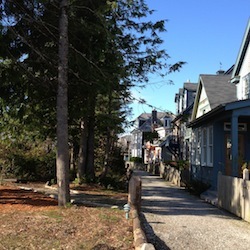 Homes become lower and closer to the paths, with front porches. Terminated vistas provides a sightline, or something to draw your eye down the street or corridor. It provides a sense of discovery and implores the wanderer to come down and check it out. Rather than have perfectly straight roads that disappear, homes are designed with interesting features at the curves, such as this cupola at the end of the vista on the left. The garage on the right was designed to be canted rather than square to the street. Cluster housing keeps the homes close together preserving the best real estate for the public to enjoy. 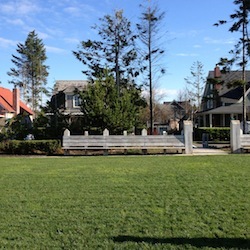 Lawns become common greens like this one and individual lots are planted with native vegetation. Not only is this more environmentally friendly, but it is more social, creating gathering places for the community. Retail is temporary until Main Street is built. Main Street was saved for last because there isn’t enough critical mass to support it, so it would surely fail. But some retail is necessary to provide amenities to current owners, so temporary retail locations are done well, and provide the very basic needs for now. Over lunch, I asked Casey why he goes to all the trouble. Most developers would quickly build as many homes as possible for the maximum profit they could. Doesn’t his approach eat into his profit margins? I could have guessed his answer, but I wanted to hear. The margins come when you build a highly desirable product; when you don’t obsess over the cost of doing business; when you refuse to cut corners. The team doesn’t have to rely on sales “tactics” and creative marketing campaigns. Instead, they take a scientific approach to getting found. Drive visits, not real estate sales: Get people to visit. The real estate sells itself. Optimize content for search engines: If your prospects can’t find you or don’t know about you, they won’t come. Nurture media and blogger relations: Nurture existing relationships, because they are getting a ton of media. This builds awareness and helps with SEO. Foster the community: Using social networks, they are helping their own community advocates spread the word. They don’t sell real estate using social media. They create community, build awareness, and extend their networks. If the planning, attention to detail and overall customer experience doesn’t go into product development, no amount of creative marketing strategies are going to work. And this is why, my friends, marketing begins at the planning table.